We arrived at Horton-in Ribblesdale in the early hours of Saturday morning, to be met by a full car park and lots of other walkers. Seeing everyone there, mostly supporting charities of their own, was very heart-warming, although did rather spoil any kind of feeling of being intrepid – it felt more like the walking equivalent of a motorway in rush hour. 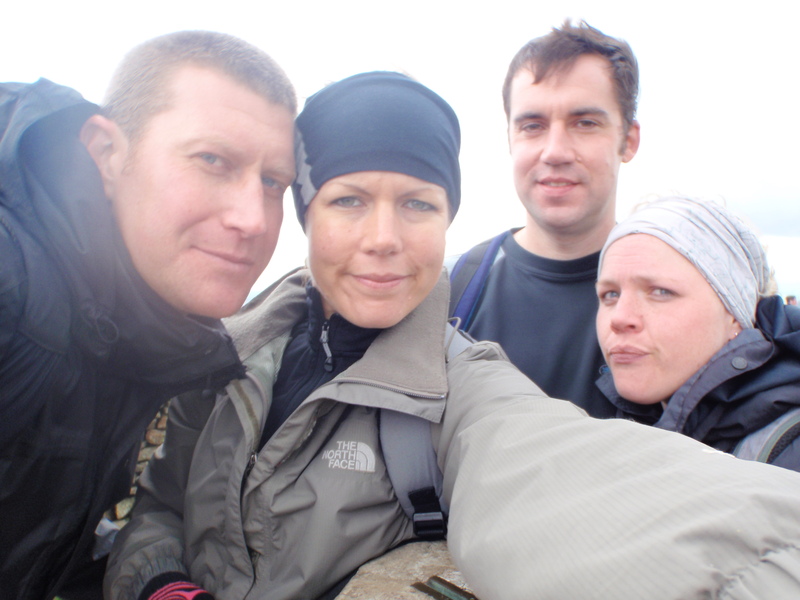 The light-hearted jolliness and chattering soon wore off, as we all set off to the first peak – Pen-Y-Ghent. Quite a shock to the system, as you start climbing as soon as you leave the village, this was the first point at which I started to question the wisdom of my decision! It felt like one minute I was still in bed and the next I was scrambling halfway up a giant hill. It progressed from a gentle ascent to a true scramble, holding onto the rock as you climbed. No wonder I was feeling somewhat nauseous at that point. I was also really hot, as although the weather itself was still cool, climbing was making me warm in my thick waterproofs. Hence the red face in this photo, at the top of the first peak. 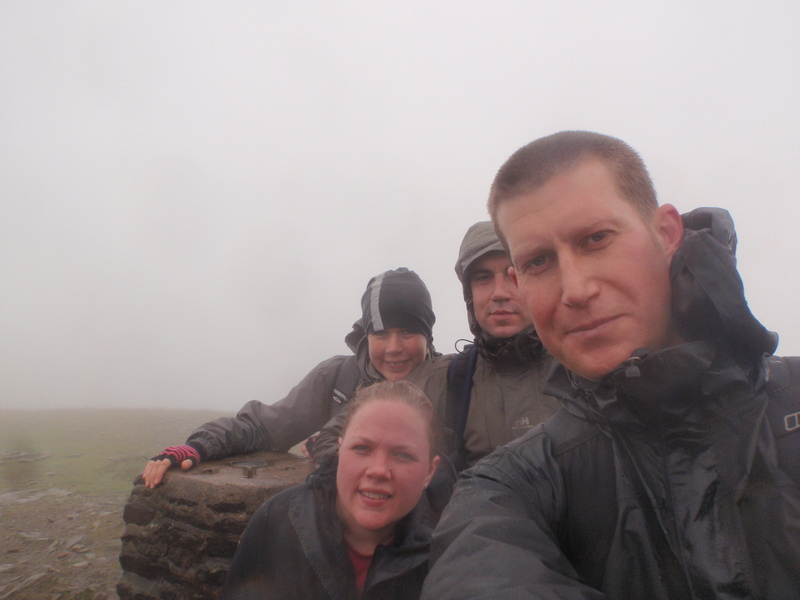 Finally we reached the summit of Whernside. We started off walking towards Ingleborough National Nature Reserve towards the peak of Ingleborough, but as we walked along, I could see no sign of a recognisable path to the top. I could see a steep waterfall running down the side of the hill in front of me, and as we got closer, still at this point in sunshine, I realised that the steep waterfall was in fact, the path. With a true waterfall next to it, the steps of the climb were running with brown water from the top. The crowds of people at the start had really thinned out to a hardy few who were going to finish this challenge, no matter what. We reached the bottom of the real climbing part, and David put on his waterproof. Still warm and, after putting on and taking off my thick coat one too many times, I decided to leave it off for the climb to the top. Bad decision. Very bad decision. We started climbing, very slowly, pausing either for breath or for the person in front of us and using the rock to hang onto. Then it started to rain. Obviously, I didn’t have the chance to put my coat on as there was no way I was going to mess about taking my rucksack off halfway up the sheer, slippery rock to try to get my coat out. 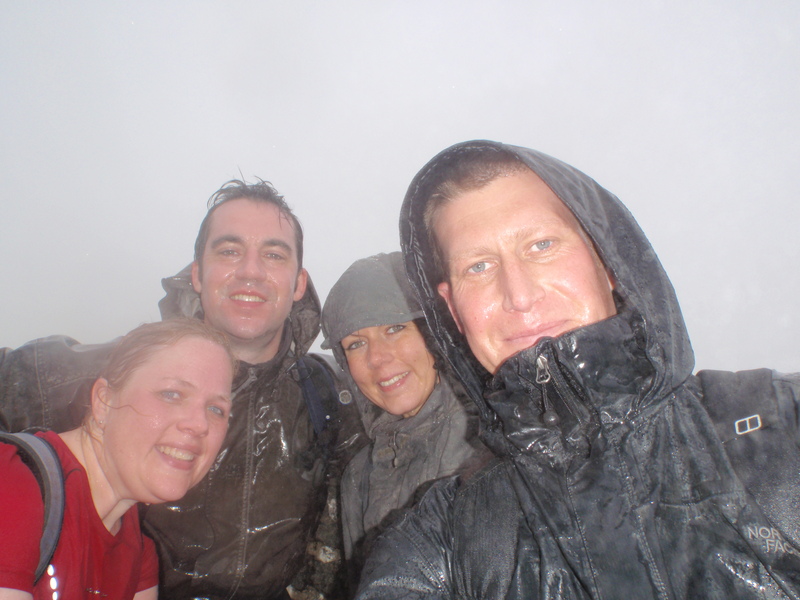 By the time we were close to the summit, we were walking up what had rapidly become a true waterfall of rain water. I was soaked to the skin, and the wind was driving the rain into my face. We finally got to the top and then, seeking the Trig point, had to walk along the top, barely able to see, and then stop for a photo (“let’s get the formalities over with’) before I finally got to put my coat on! Leaving Ingleborough with a huge sigh of relief that all three peaks had been reached, we then had quite a long walk back to the official clocking in cafe – where we needed to be back within 12 hours to qualify for 3 Peaks of Yorkshire Club membership – which I was determined not to miss out on, having done so much to get to that point. We walked on, until we finally reached the end, clocked out with only 15 minutes to spare ( but a very important 15 minutes!) and we’d done it! A quick clothing change for our final photo, then off to get some very well deserved chips and a cup of tea. Still smiling at the end! I have to admit, I cried tears of relief and exhaustion at the end. Once I was sitting in the car, wearing a nice dry outfit, and looking forward to my cup of tea, I was struck by how much of a true challenge this had been for me, as someone who has to fit in exercise alongside a full time job and two small children. I’m glad that I’ve done it, and very glad that I’ve raised some money for a well deserving charity, but for now, I am hanging up my walking boots! Wow I am full of admiration, well done for fighting through it. Cycletta will be a doddle for you. Thank you! I did find it really hard, but I’m glad I completed it – definitely a highlight of the 35:35 challenge! I am hoping Cycletta will just be a fun day out, and build on my newly-found enjoyment of cycling. Not raising money for charity that day, I’ll sponsor you instead!! Just wanted to say many congratulations for finishing the challenge – and within the 12 hours too! I loved how you described the day – took me right back to when I did it about 8 years ago! The last few miles were sheer hell, THAT much I remember – that, and the hot chocolate which was very welcome at the cafe! Wowsers well done you *stands and claps* , not only a good deed for charity but a personal sacrifice too!